Securely and conveniently access your practice's TMS data in the cloud from any mobile or Internet connected device. We know a thing or two about designing repetitive TMS systems. We manufactured our first device in 1996 and are now in 35 countries and 1500 units strong, and growing. Our latest TMS device can fit in the backseat of your car and moved from room to room with ease. Modular design ensures maximum reliability with minimum downtime. Advanced cooling technology enables long continuous use times without having to worry about overheating. Simply plug in your CloudTMS machine and power on. With its intuitive software controls and streamlined interface you'll be up in running in minutes. We wouldn't leave you hanging. Our device comes with everything you need to get started with your TMS practice, including training, our angulated figure eight coil, touch screen laptop, and easy cart. With an ergonomic design curved to fit over the patient's head, state of the art cooling technology, and an angulated design, our figure eight coil can also be handheld allowing for superior targeting and location of motor threshold hot spot. Introducing CloudTMS, a revolutionary cloud based repetitive TMS machine for the 21st century. Access your practice data conveniently and securely from the cloud. An easy to set up, complete solution means you'll be up and running in no time. The CloudTMS machine is delivered to your practice on a date of your choosing. A certified trainer conducts training on location with your staff. 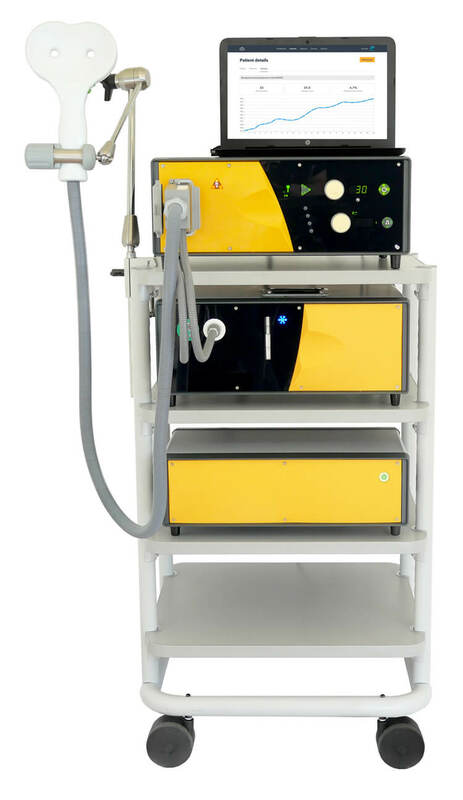 Our FDA cleared TMS machine comes with the best cooling technology on the market keeping our coils cool even during long continuous use times. Our sales are direct to customer so we don't have to maintain a costly salesforce like the competition. We pass the cost savings onto you. Explore exciting new research with Dr. Jonathan Downar during his lecture at the Toronto Western Hostpital site of UHN.